Looking for a Musician / Band For Hire in the Harrisburg Pennsylvania Area? Billy Wray is an acoustic piano player (pianist), keyboard player (keyboardist), instrumental composer and recording/studio artist available for your upcoming wedding ceremony, background piano/keyboard music for your wedding reception, private/corporate party or function, bar/bat mitzvahs, wedding anniversaries, birthday parties, sing-along, retirement communities & homes, concerts, or entertainment at holiday parties and special celebrations. 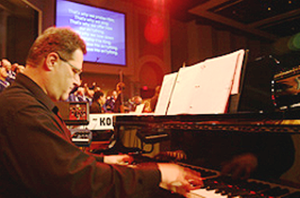 He plays piano/keyboard and acoustic guitar for the surrounding South Central Pennsylvania Harrisburg York Lancaster City & County area including Adams, Cumberland, Dauphin, Franklin, Lancaster, Lebanon, Perry, and York Counties. Want more musicians? No problem... duos, trios, quartets, and full dance bands are available in any configuration. All music styles are offered including soft/light background jazz, light classical, pop, standards (Sinatra, Tony Bennett, Louis Armstrong, Nat King Cole, Dean Martin), Oldies (50's and 60's), Classic Rock (70's), Motown, R&B, Island Music, Show tunes, Gospel, Country, Latin, Rock, to Dance music of yesterday and today. He can accommodate any style of music for any occasion.